I was absolutely struggling! Very surprised I didn't have an asthma attack going up, it was 176 stairs!!! So after that workout I was very deserving of a coffee, and the best place for it in London is The Espresso Room. It's run by Ben Townsend, who is clearly very passionate about his coffee, but after the StairMaster test and nearly passing out in his cafe all I wanted was something, anything to drink. So after the coffee did its job I took the tube again, and asked the officers which station was closest to Tate Britain - my map had the location of the gallery but conveniently cut out the closest tube station. He told me to got to Southwark, and I did, only to find out he had directed me to Tate Modern instead. Oh well, I guess I had to look at Dali and Picasso instead of Bacon and Hirst. The Turbine Hall at Tate Modern. I quite liked the gallery, especially since entry was completely free! My only disappointment was that I didn't have a lot of time to enjoy the gallery to the extent I would have liked, but I'm still glad I went. So after the aimless wondering and window shopping at the gallery store (which I love doing, regardless of the city - some of the best things I've bought have been at art gallery stores) it was back on the tube again to Angel station, and a quick stroll through Camden Passage in drizzle to Elk in the Woods. Last time I was here I ate a more upmarket version of bangers and mash, but they've changed the menu since then, so I decided on some Frikadeller and potato salad. So after my pork pig-out (very fitting during Ramadan) I went back on the tube to Magma bookstore, on Clerkenwell. A quick look at my watch, and I decided that if I wanted to get to work on time well groomed I'd have to make my way back to Heathrow, so my day ended there. Considering my allowance for the trip was £58.50, and I spent £55.78 I think I did very well! The downside to the trip, as with every layover I do, is that 24 hours is not enough to cram in all the things I would have liked to do... but hopefully for those of you who are taking a holiday here in the future it will give you an idea of what can be done without spending a ton of money, and give you a few ideas as to what is on offer should you venture beyond the well-beaten tourist track. If you have any suggestions or know of anywhere cool I have to try out next time, feel free to leave a comment! UPDATE! 23/8/10 - Thought it might be a good idea to include the address of the places visited! The Espresso Room - 31-35 Great Ormond Street, London. Open Mon-Fri, 7.30am to 5.00pm). Russell Square tube station. Tate Modern - 53 Bankside, London. Open Sun-Thurs 10.00am to 6.00pm, Fri/Sat 10.00am to 10.00pm. Southwark, London Bridge, St Pauls or Mansion House tube station. Tate Britain - On Millbank, London. Open everyday 10.00am to 6.00pm. Pimlico tube station. Elk in the Woods - 39 Camden Passage, London. Open 9.00am to 6.00pm. Angel tube station. Magma Books Clerkenwell - 117-119 Clerkenwell Road, London. Open 10.00am to 7.00pm. Farringdon or Chancery Lane tube station. Magma Books Covent Garden - 8 and 16 Earlham Street, Covent Garden, London. Open Mon-Sat 10.00am to 7.00pm and Sun 12.00pm-6.00pm. Covent Garden and Leicester Square tube station. And BTW the liquid in the shot glass in Elk in the Woods I later found out was Gammel Dansk, so thank goodness I didn't drink it! So I recently came back from a Houston flight, and apart from getting my suitcase locks broken, and seeing Inception for $5 USD at the cinema (it costs 30 AED here! ), it was a relatively uneventful trip. Security is notoriously picky in the US compared to everywhere else I fly, though if you ask the majority of my workmates they will almost always say that the Australian and UK security are the most strict. But there was something I saw on my Houston trip that annoyed and flabbergasted me at the same time. But before I tell you guys I’ll let you know about my pre-security ritual. Before I leave home – I do two things that really saves time at the airport. First thing I do is wear a watch with a non metal strap. Whilst there are still metallic components within the watch mechanism itself, I find that most airport metal detectors don’t pick up on it. If I wear a watch with a metal strap, I almost always need to remove this. The second thing is that I pack my laptop within my checked luggage. I know you’ll freak out, and think “What if it breaks?” “Won’t it get stolen?” But honestly most of my computer malfunctions have happened after carrying my laptop in my cabin luggage during a work trip. It gets bashed around the crew bus, it gets shoved to the side of the hat rack when a passenger wants space for their own oversized bag. It also weighs a ton and takes up a lot of space in a bag that is already supposed to be carrying our safety manuals, service jackets, cabin shoes, and if we’re on long haul, our bunk pyjamas. If I pack the suitcase right, I can cushion the laptop (which already travels in its own neoprene sleeve) in between my day clothes and my uniform and as a result I have NEVER had my computer malfunction after it’s spent a trip in the hold. Since I cannot use my laptop during the flight anyway whilst at work, its just dead weight I’m lugging around. Obviously not everyone can do this, especially if the flight you’re taking is a work trip and you need it during the actual flight, or if you’re flying to a dangerous place where there is a very real possibility of the laptop getting stolen and traded for livestock at the local market. But if you’re doing a trip from, say, Frankfurt to Amsterdam, just consider whether it is worth lugging around for a 1 hour flight. 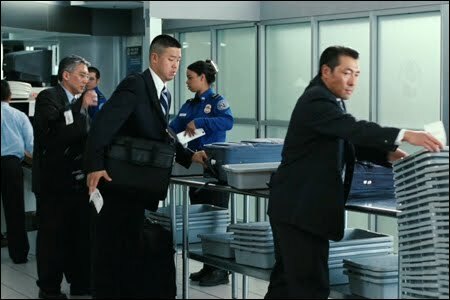 So now we move onto the actual airport screening, and this brings me to what happened at Houston. To be honest after 5-6 trips there now I find the airport staff to be alright, they don’t appear to be on massive power trips like their colleagues at JFK International. Anyway us crew line up to use the scanner and X-ray machine, which is usually the same line that is used by unaccompanied minors, diplomats and wheelchair users. There was a lady who was classed as a wheelchair user, looked to be about 55 years, but was able to walk through the metal detector. She was getting beeps every time she went through the machine. Each time she went through she removed one item only, first a belt, then her watch, then her shoes, then her glasses, then her necklace. Each time leaving us super frustrated that she couldn’t do all this the first time she got beeped. Eventually she removed all she could possibly remove, went through the machine, and yet again it beeps. She was in tears, yelling in (I think) Espanol at the security guards who were frustrated themselves and just trying to do their job. However the offending material was something that could not really be removed without protecting this woman’s modesty - and it was so obvious, it burned into the jetlagged retinas of all of us cabin crew who now feared she was going to delay our boarding. Well these aren’t the exact jeans, the ones she was wearing were more of a “Mom jeans” cut, and the bedazzling above the knee rather than below. But she still was wearing enough metal to set the detector off through the jean studs alone. 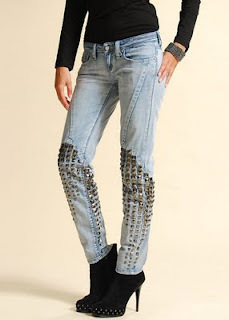 It beggars belief – if you’re going through airport security, through a metal detector (sometimes 2 or 3 depending on where you are) why on earth would you wear studded jeans??? They’re not even comfortable to wear inflight! So think about what you wear for the flight - you want it to be comfortable, smart and most importantly NOT LADEN WITH METALLIC STUDS!!! Regarding shoes - I know ever since Richard Reid tried to light up explosives hidden in his shoe back in 2003, US security have made it a requirement to remove shoes to be scanned in the X-ray. But everywhere else this isn't a requirement, quite often when I've taken off one of my work heels to go through airport scanners, a guard stops me and tells me it's not neccessary. I then say to him, yes it is, my heels have metal inside. I guess what many of us ladies don't realise is that to make heels more stable to walk on, there is a metal bar fitted within the shoe, used either to support the heel, even the entire heel could be solid metal in itself, which would set off any decent airport metal detector. It doesn't happen with flats, or any men's shoes, just heels of any height. If you find it neccessary to wear heels for your flight, then at least have a bit of forethought to put them in the X-ray tubs first as a matter of habit. And any advice that Ryan Bingham says in Up In The Air is spot on - invest in a pair of slip on shoes rather than anything with buckles, straps or laces. Time is precious, and the amound you save by doing this is astounding. I guess the last bit of advice I can give was something I learnt myself from a security guard in Dubai. One day I was on airport standby, and got called out for some horrible 12 hour turnaround. The crew were already on the aircraft, and with me assigned to the trip it would fly with the absolute minimum crew, just enough to man the doors. I was rushing through the security sreening, and stormed through the metal detectors, and kept getting beeped even though I had nothing metallic on. And like the lady in Houston, I was getting frustrated as well. The security screeners said all I needed to do was walk through the metal detector more slowly. Slow - as in you're walking down the aisle at your own wedding slow. And you know, it worked. I don't know what it is, or why it does work, but consider it a flight attendant trick of the trade. If you have any tricks you think people should know about, feel free to leave a comment!